Please NOTE: Rivergate Distributing provides this information as a service to help our customers. This information is based on actual use as told by our customers. But we are not responsible for any errors or omissions contained in this information. We strive to ensure this information is accurate but cannot be held liable for its use. What follows below are these suggestions. To get maximum performance you need to connect your capacitor as follows. 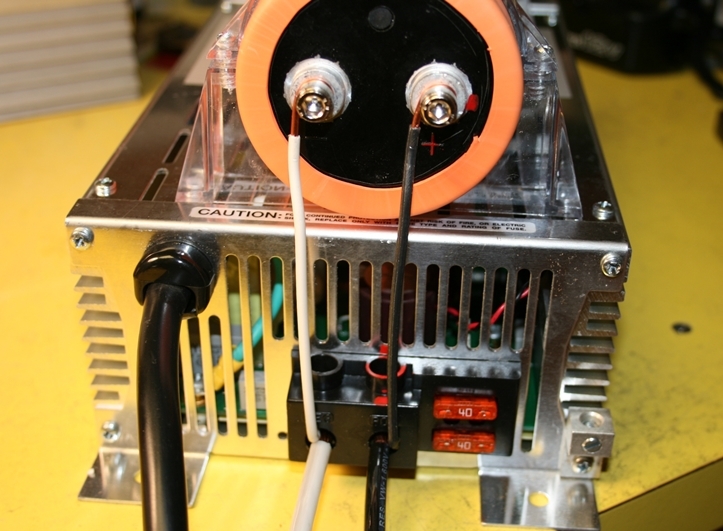 With power supply unplugged and disconnected from the AC wall power do the following: Using the shortest possible connection, connect the positive + plus side of the power supply to the positive + side of the capacitor. (Black wire in photo) Next connect the negative side - minus sign if marked on the capacitor to the negative connection on the power supply. (White wire in photo above). Use at least 12 gauge solid wire for this connection. It is suggested, especially drag tracks, that you run two, 4 gauge wires under the track its entire length. The 4 gauge wires should be connected every 3 feet or so, one wire for each side conductor. This will increase current capacity and help protect the track. Note these are only suggestions based on input from many customers who own / operate these types of tracks and Rivergate Distributing in no way assumes responsibility for your actions regarding these connections. It is also suggested you 'test' your capacitors by connecting them to the power supply with no other load and let it run for a day to ensure the capacitors you have bought are of high enough quality to withstand the voltage that the Slot Power Supply puts out. Several customers have had the capacitors blow in just a few hours, indicating poor quality capacitors.. Again make sure you use capacitors that are rated a minimum of 20 volts. Customers tell us that the 24 volt rating is a better choice.